Yes, Virginia, I have Maps, and last August I'd organzied my stash to begin sharing info about it. I got distracted with all the other subjects I've covered since, and it took a comment by poor Dave to remind me. My apologies to one, and all! One great place for anyone to find Bike Paths, and plan rides, is BikeMetro. It covers Los Angeles, Orange, San Bernadino and Riverside counties, so check it out. Here is a description for the 3 mile Arroyo Seco Trail in the Pasadena area, and the 3 miles of completed LA River Trail near Griffith Park. A guide to bicycle paths around Los Angeles and Northern Orange County: 'Class I,' paved, separate right-of-ways, mostly in parks, along rivers, beaches, and lakesides. Click the path on the map or use the drop down menu to see a close-up of a path. Check it out here, for more. In looking over the maps in my LA COUNTY FOLDER some do not allow for easy translation into Route Slips, and my recommendation is to contact the neccesary agencies to get your own copies. 1. 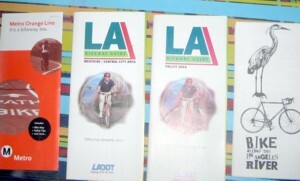 LADOT - LA Dept. of Transportation: You can order Bikeway Guides for the Central City/Westside, Harbor Area, and San Fernando Valley, or explore the whole thing on a clickable/printable map online. The Website has links to other such maps for local cities, and Orange, and Ventura Counties. The LADOT Maps are not the greatest as the names of most streets are not shown, but try using them in tandem with a Thomas Brothers Map. There is a lot of other useful info on the website. The Metro Orange Commuter Train Route, from North Hollywood, west to Warner Center, has a Bike Trail alongside it, and includes Bicycle Parking Facilities. At the western end of the line, from Variel, cyclists will be riding along regular city streets, and sidewalks to the Warner Center area. Eastbound, most of the route is an off-street Bike Path untilthe Valley Village area. At Chandler, the Bike Path becomes on-street bike lanes to the North Hollywood Station. You can find the Flier at MTA Display at Union Station, or order it from MTA. 3. On the Metro Website, there is an outstanding Interactive Map that shows Bike Lanes, and Bike Trails, all over LA County, and is quite detailed as you zoom in. 4. In 1999 Occidental College, and the Friends of the LA River, sponsored a year long event called Re-envisioning the L.A. River, and one part of it was the production of a map in conjunction with the Bike Along the Los Angeles River Event on October 17th of that year. It was a tour of Architecture, Art, Nature, Community, and Transportation, in the area, on routes along public right-of-ways used every day by cyclists, and others. 150 cyclists participated in the event and, sadly, only 1500 copies of the map I have were made. How many copies still exist is a mystery to me. There are 7 Routes, from 3.2 to 10.8 miles, and the text, maps, and illustrations were put together by Joseph L. Linton, a long time Cycling Activist in Los Angeles. Realizing what a gem this collection of rides is, as I look at it, I want to try to ride them, and devote more space to each than what I can say here.